I knew this problem was prevalent. But today I got a chance to see how widespread it is with me being a part of it. The addiction is the internet. 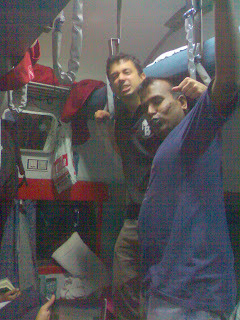 We, a group of 10 started a journey for Bangalore last night from Mumbai. The last moments before leaving the campus were on the net. A 24 hour train journey followed. Thanks to the ubiquitous mobile towers, we were well connected on the mobile. Some technological constraints like battery running out did exist but that can be largely blamed on to the Indian railways – for not providing charging facilities. But 1 thing that was missing was the access to the internet. Though technology has advanced to provide us the facility but we, generally used to the constancy of Wifi in our college and home are not adapted to the data cards as of now. It was around 11.30 PM when we reached our hotel after a long tiring journey. The news of internet being freely available in the hotel was a news that brought life to all the dead tired faces and in no time each one of us are in their respective rooms on their Gtalks. Freshening up, tea/coffee/dinner – all can wait. The priority is getting plugged to the world – to return to the matrix. Strange – our lives have become - the same lives which we lived without even mobile phones till a few years ago. With what I experienced today, it feels that the physical existence is starting losing its significance. Its feels almost the same sitting at my table in Mumbai or some hotel here in Bangalore. Wonder where we are headed. For now it is just a sense of addiction with some long term implications. totally agree....its a gen of netoholics...where virtual being is taking over the physical..lucky u had net at the hotel!! Technology is a great enabler, but it can enslave you !lol!